5 Best Ukuleles Under $300 – What Makes a Great Uke? This mid-range ukulele article was in need of a refresh in a few areas, so we changed our baritone, tenor, and soprano offerings. The link aa postid=20739]Martin OXK Soprano[/link] made way for the delightful Luna High Tide Soprano,and the elegant Kala KA-SBG Baritone replaced the Cordoba 24B Baritone. Finally, Fender’s Nohea Tenor was removed and replaced with the newer Fender Montecito Tenor. Whatever your playing style, whichever size you prefer, and whatever level you are at, $300 can get you a lot of ukulele these days. Who Buys a Ukulele in This Market? Should I Buy a Used Uke? This market sees the end of entry-level ukuleles and the introduction of instruments with higher-end qualities and more premium components. This isn’t the true high-end market, but it’s close! So, to highlight some of the finest models in this price range, we’ve compiled a short chart of the best five ukuleles under $300. We’ve ensured to focus on at least one from each soprano, concert, tenor and baritone size. Of course, there are many more models worth your time and attention, but these five give you a good cross-section of the brands and styles that are available to you in this category. Let’s dive in! Luna impress with this unique marine-themed concert uke. Luna impress with this cute all-koa electro-acoustic. As one of the more expensive models on this list, this Luna had to do a little more to impress us – and it did. The high rating is mainly down to the gorgeous aquatic design. It sports a full-size concert body made entirely of laminated maple, with flamed maple on the top, leading to a very bright and crisp tone. This is all enrobed with a high-gloss trans-azure finish, while the focal point is three dolphins swimming around the soundhole – very unique, and a nice talking point! As for hardware, this Dolphin features a pickup and Luna’s UK-T2 preamp, along with some quality components, including a gig bag – all highlighted in the Luna Dolphin’s full review. Quality woods, a timeless design, and solid craftsmanship all combine to offer a baritone ukulele worthy of your time. Kala use the classic pairing of solid spruce on the top and laminate mahogany on the back and sides to give the 30.5” KA-SBG a traditional, elegant look, and a well-balanced sound. In terms of tone, it’s a powerful ukulele, and one which will grow in warmth as the years pass, thanks to the use of solid wood. The hardware matches the woods’ qualities, with a set of reliable closed-gear tuners, GraphTech’s NuBone nut and saddle, and Aquila strings. Overall, it’s hard to fault. The full review of the Kala KA-SBG offers all the details on this excellent baritone uke. The wildcard of our list! While we usually avoid plastic bodies, this FLEA Concert ukulele from The Magic Fluke Company is a good exception. With an almond-shaped concert body, the back and sides are made from a durable injection-molded thermoplastic, while you get some wood with the laminated birch top (finished in several color choices). The hard maple neck is very playable indeed, with a polycarbonate fretboard and 15 molded frets. As we mention in the FLEA Concert ukulele’s full review, it’s excellent for travel as humidity and a few knocks won’t affect this well-built American-made instrument. The sound is also pretty great for a semi-plastic instrument – bright and clear, but very well-balanced. 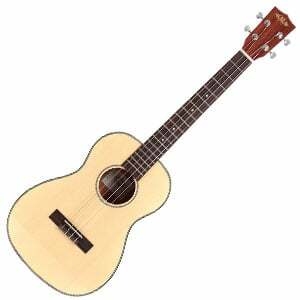 Another Luna makes our chart, although this time it’s a cute soprano uke with a lot to offer. Again, it’s undeniably Luna in its design and build – offering a beautiful lunar/high tide theme, with abalone waves working their way up the 12-fret walnut fretboard. The neck is made of mahogany, while the body is made entirely of solid koa for a traditionally vibrant Hawaiian feel. Being an electro-acoustic, this uke features a Luna-designed piezo pickup and preamp with simple volume and EQ controls. The natural sound is very bright and sparkly, although will warm up with time due to the solid-wood construction. You can read a little more about the Luna High Tide in the full review. If you’ve been playing the ukulele for a while and fancy your first proper upgrade, this is the section for you. Or if you’re an experienced ukulelist wishing to dabble in a different size – maybe moving from a concert to a tenor – this price range offers you the quality you may be used to, at a price that won’t punish your wallet. While experienced players will be able to appreciate this range a little more, that’s not to say beginners can’t benefit from purchasing a higher-end model. At the end of the day, learning on a ukulele that looks, feels and sounds better is more likely to encourage you to actually practice! While the models in the chart above may appeal to you, if you are a beginner it’s also worth checking out our guide to buying a beginner’s ukulele, which offers some ukuleles and packages that will really benefit beginners. First and foremost, you should notice a step-up in playability and quality from those ukes you find in the sub-$200 range. The ukuleles in this range should also be very well made. Gone are the days of rough spots and sharp fret edges – leave those for the entry-level market. The woods on offer in this category are much more wide-ranging too. You’ll still find mahogany is regularly used, but cedar and maple are more prominent, as are exotic woods like koa. Solid wood is used more often too, especially on the top of the instrument, although some brands still prefer to use good-quality laminates – Martin’s OXK is proof of this in action. If electronics are present, these systems generally feel better built and more versatile in their EQ controls, while projecting the sound more naturally. As for nuts and saddles, materials such as bone and Tusq are now the standard. 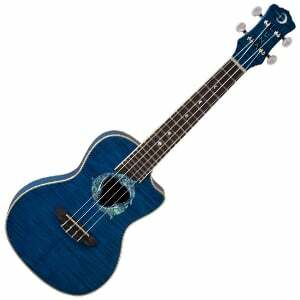 You can also expect a ukulele in the sub-$300 price range to come with a gig bag. Some don’t, of course, but brands like Martin, Fender, Luna and Kala tend to offer something convenient in which to store and transport your new uke. This is the first ukulele market where you may consider buying a used model (after all, who wants a used entry-level ukulele?). While buying new gives you that unmatched sense of owning an untouched instrument, there are reasons to buy used – the main being that you could pick up a $300 ukulele for maybe half the price. Providing you are able to try the uke before you buy, or are able to purchase it from a reputable store (either physical or online) with a clear and fair returns policy, then you should be safe. Just do yourself a favor and avoid anything from a flea market or thrift store, unless you can inspect and sample it properly. As $300 is more of a dent in most bank accounts, make sure the model you go for is something you are completely satisfied with. Create a shortlist of ukuleles you like the look of, then narrow it down to the one you can’t live without. If possible, try the ukes out in a guitar store. Otherwise watch videos on YouTube, or read reviews online. To create shortlist, start by checking out the five models on our chart, then move on to others you fancy. Brands including Kala, Lanikai, Gretsch, Luna, Cordoba and Martin all shine in this sub-$300 market. There are others, but sticking with one of those should result in an instrument that will make you happy. If you are able to find a few extra bucks down the side of the sofa, be sure to have a look at our chart on the best ukuleles under $500, as a model in this premium category may offer you something even better for not that much more money.